In case it comes up in a game of trivia or a pub quest, did you know that the escalators down to the Piccadilly line are the second longest in London. They take you down a whopping 54 metres. 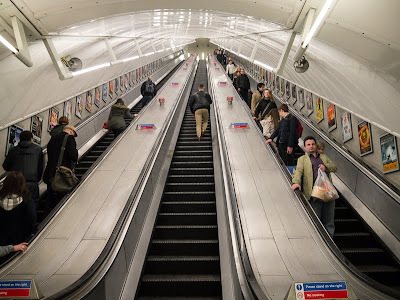 They did hold first place for many years but were over taken with 60 meter escalators at Angel in Islington as part of the refurbishment in 1992. Nice picture, they are very deep. I love this shot and I'm pretty sure I've been in this one. Wow, those definitely are some intense escalators! I do know this. But I'm not going to lie.... going DOWN these escalators make me very nervous. I get all dizzy! And my ears pop. Such a fun escalator to take! I love this amazing view of it. Isn't the Piccadilly line the deepest one in London? It always seems to be the hottest in the summer! I remember going down this escalator and feeling overwhelmed. It seems to go on forever.